What is a better host for Guerilla Haiku than an organization who shuts down the main drag of Downtown San Antonio to release 1000s of people in chalking bliss?!?! Just such an organization is Artpace. And just such an event is Chalk It Up!, one of the largest-scale chalk art /community engagement events in the nation. 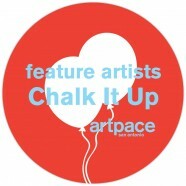 Guerilla Haiku will be in-residence in San Antonio from the 6th of October until the Chalk It Up! event on the 12th. Haikuing will occur at the San Antonio Museum of Art Family Day and Educator Evening on the 5th and the 9th respectively to celebrate their new ‘Lethal Beauty, Samurai Art and Weapons’ exhibit. Schools visits and community visits will comprise the rest of the week’s events. San Antonio! Guerilla Haiku is coming!!!! Contact haikumistress@ghm575.org if you would like to coordinate a haiku event at your organization!